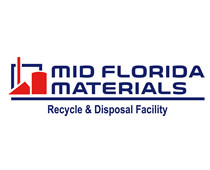 Registration is Open – 2019 Winter Summit | Recycle Florida Today, Inc.
response essay sample Make plans now to participate in Florida’s leading education and networking event for the recycling, sustainable and environmental professional. Recycle Florida Today will be hosting the 2019 Winter Summit on Wednesday, February 27, in Orlando at the Rosen Centre in partnership with the Southeast Recycling Conference and Trade Show (SERC) that is being held from February 24-26. This year’s agenda covers a wide area of topics including collection innovations, corporate sustainability, best business practices, public education and more. Register now and take advantage of the discounted early-bird rates and a discounted rate for attending both the Winter Summit and SERC conference. Don’t miss the opportunity to gain valuable insight and knowledge while networking with other environmental and recycling professionals from both events. Join Florida’s premier recycling association for a day of well rounded education and networking opportunities in Orlando, FL. Attendees will be able to gain valuable education and network with leading industry professions, annual and event sponsors in from around the State and beyond. Environmental professionals from Local and State Governments, Private and Non-Profit Sectors, Program Managers, Recycling Coordinators, Directors, Managers, Consultants, Regulators, and those interested in the business and development of the recycling industry. follow What does registration include? http://www.wellchild.org/viagra-for-men-without-ed/ Winter Summit registration includes: conference credentials, access to educational sessions, and RFT networking breaks. Receive a discount when you register for both the SERC and RFT conference and gain access to both events. Visit http://southeastrecycling.com for registration information for both events. follow link RFT networking breaks include: One (1) continental breakfast, two (2) refreshment breaks, one (1) reception the night before. *Lunch is on your own. http://www.drpadgett.com/levitra-10mg-prix-2010/ Ask for Reservations Department. go to site SERC Room Block Rate is $195 per night plus taxes. follow url Government Room Rate: $133 per night – Based on availability. Wellbutrin Sr Rate is valid three days pre SERC and three days post SERC. buy viagra online in united states Make sure to mention Southeast Recycling Conference & Trade Show (SERC) to get the discounted rate when making room reservations. Show your support and receive the recognition you deserve. Sponsorship packages are available, ranging from $400 to $1,250 and include a range of benefits to your organization. Download and secure your opportunity today! Click here to download a sponsorship form in PDF format. * Rates good until 1/18/19. If you cannot attend, written notification must be received at least 10 working days prior to the conference. You may either send a substitute or receive a refund minus a $75.00 processing fee if your request is received before February 14, 2019. No refunds will be granted after the February 14, 2019 notice period for any reason. 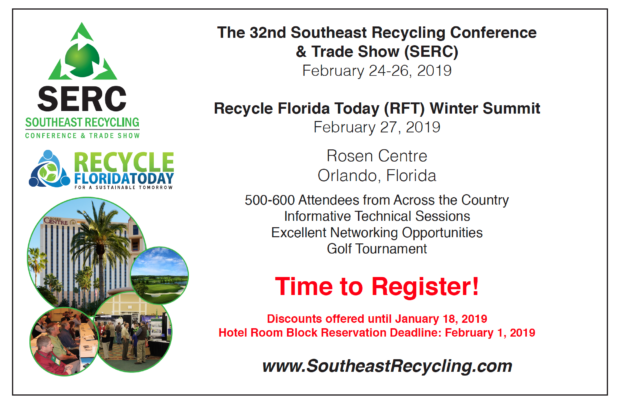 In the event of bad weather or if the conference is cancelled, the Southeast Recycling Conference (SERC) or Recycle Florida Today, Inc. (RFT) is not responsible for nonrefundable travel fares or lodging, nor will SERC or Recycle Florida Today, Inc. (RFT) issue refunds for registrations, exhibits, sponsorships, event activities or any associated fees. Busch Gardens Environmental Tour on Oct. 26 – Registration is OPEN!